astrovid.com 이라는 망원경 가게 홈페이지에 캐논 카메라 개조품이 소개되어 있습니다. 350D를 사용하시는 회원님들에게는 이미 다 알려진 정보일 것으로 생각됩니다. 기존의 IR cutoff 필터를 제거하고 대신 두장의 보강 필터를 끼워서 판다고 합니다. 개조사는 Hutech 라는 곳입니다. 뒤쪽 필터(RF)는 Clear 필터(모든 밴드 패스, 일반촬영시 IR 블로킹 필터 필요)나 Type 1 밴드 패스필터(UV/IR 블록킹, H-알파 통과시킴, 일반 촬영시 화이트밸런스 조절로 가능)중 택 1. 물론 20D 카메라도 개조해서 팝니다. Hutech now offers Canon digital SLR cameras which have been spectrum enhanced to make full use of the bandwidth of the Canon CMOS sensor through the use of custom designed filters. These include the consumer level 6-megapixel Digital Rebel (300D) and 8-megapixel Digital Rebel XT (350D), as well as the professional level 8-megapixel 20D. Standard Canon cameras, like most modern digital cameras, incorporate IR-cutoff filters which also cut into the deep red end of the visible spectrum, greatly reducing response to a scientifically important part of the visible and IR spectrum. These enhanced cameras are brand-new units, especially enhanced for scientific/engineering applications such as astrophotography or general near infrared photography. A Hutech warranty covers the original camera and enhancement for 12 months. With the first option, the standard IR filter is completely removed, allowing the full sensitivity to be utilized. This is fine for a totally dedicated scientific application where the camera's autofocus or daylight white balance functions are unimportant. This option is recommended only where reflective optics or lenses which have been corrected for the IR are used, or in conjunction with an external band-limiting filter. The Hutech enhanced filters consist of a permanently mounted rear filter (RF) which replaces the standard Canon IR filter, mounted close to the imaging sensor. 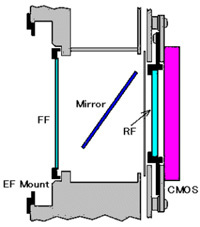 The second part of the enhanced filter set consists of a front filter (FF) in a holder mounted in front of the camera's viewing mirror. This filter may be easily changed by the user. The rear filter (RF) exactly matches the light path of the standard Canon IR cutoff filter that it replaces, enabling the camera's autofocus (AF) to work properly. Options are a Clear filter, or Type I bandpass filter. 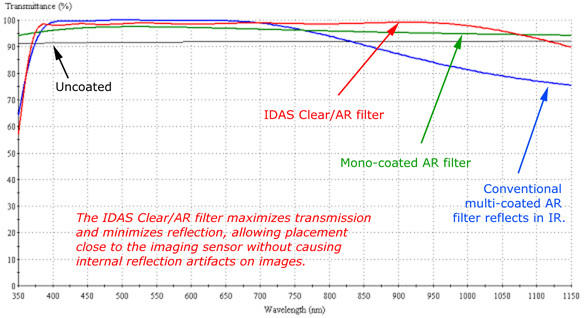 Both filters are fully anti-reflection (AR) multicoated and have been designed by IDAS, utilizing the UFP and IGAD technologies to insure undegraded and extremely durable optical performance. Clear filter - This passes all bands (including IR) and includes a fully multi-coated anti-reflection (AR) coating effective between 380 and 1000 nm. This allows the user to fully utilize the sensor's sensitivity into the IR band, but requires an IR blocking filter to be inserted at the front-mounted position for most "normal" use. Type I filter - This UV/IR blocking filter allows the astronomically important H-alpha to be recorded, and is the most cost-effective way to adapt the Canon digital cameras for astronomical use but does not allow for IR photography. It features a very sharp cutoff at the band edges to insure that reflections between the filter and image sensor are minimized. An additional filter in the front-filter position or the camera's custom white-balance function may be used to achieve proper color balance for non-astronomical photography. The front filters are mounted in a holder installed by Hutech between the camera's lens bayonet and the viewing mirror. Front-mounted filters do not affect the camera's autofocus operation but, when installed, preclude the use of Canon EF-S lenses or some lenses designed for APS-C sized sensors. These filters also affect the closest focusing distance for each lens. An alternative is to use a conventional front-of-the-lens type screw-in filter. VLC filters are available in 58, 67, and 77 mm sizes. Low Pass Filter를 제거한 20D로 감도 800 에서 4분 촬영한 결과보다 어두운 영역이 훨씬 더 잘 표현되었고 색밸런스도 아주 안정적이며 노이즈 면에서도 절반 이상으로 줄어 거의 없다고 해도 과언이 아닐 정도로 좋다고 합니다. 내수의 경우는 200만원 후반대를 형성하고 있고 정품의 경우는 300만원 초반대를 형성하고 있습니다. 올 여름에는 내수가 200만원 초, 중반대까지 내려올 것으로 예상들 하고 있습니다. 이 참에 하나 들여 놓으시죠? 회장님..